There is only one way to make consistently effective business decisions – keep them as fact based as possible. Having continuous access to reliable information removes guessing from the equation, saves great deal of time, and allows you to track the success of implemented changes. 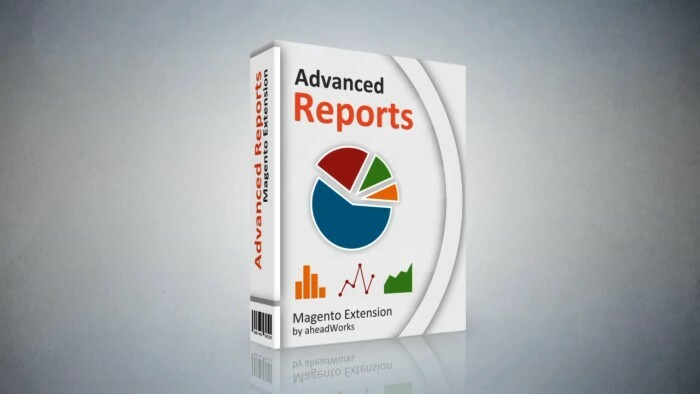 The Advanced Reports extension is a time-proven Magento custom reporting solution for extracting and organizing data within your store - 23 reports were designed to answer specific business questions and provide a clear picture of your business performance. Whether you want to assemble a list of featured products, find the perfect timing to engage social media, segment your promotional effort geographically or even stay ahead of stock shortages, the Advanced Reports Magento module supplies relevant information and helps you deal with a wide range of management issues. Start your Advanced Report experience with a comprehensive dashboard panel equipped with a list of available reports and a summary of key sales metrics, including average order value, over the last 30 days. Our latest addition allows to share reports via scheduled emails. Simply select any number of reports, type in an email address and specify the frequency of updates. No need to search for reports in a drop-down list - all of them are now listed in a menu to your left allowing you to switch reports with a single click. "Bestsellers", "Sales by Product", and "Sales Detailed" reports are now equipped with a profit-calculating formula allowing you to evaluate profit margin contribution of individual products. 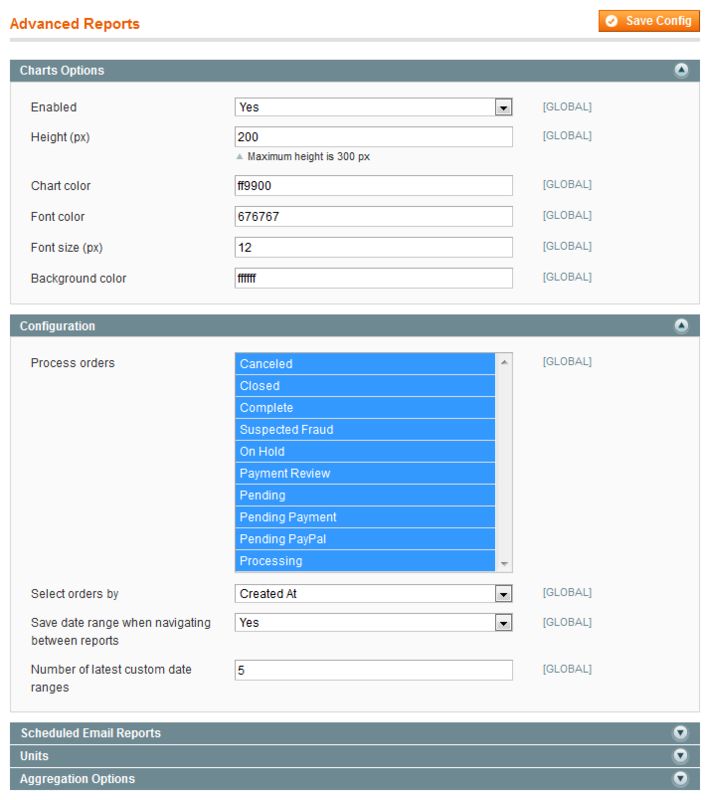 Each report can be individually customized with regards to reflected order status and columns displayed in the table. 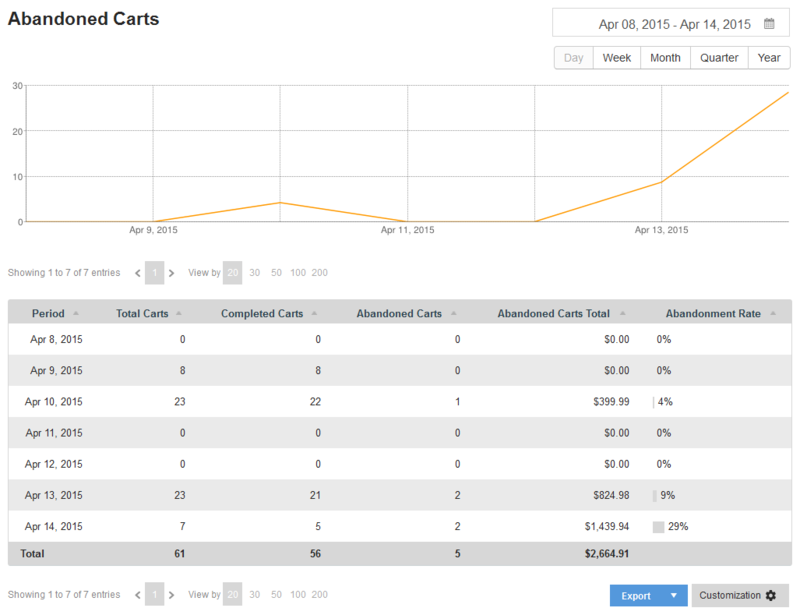 Monitor the cart abandonment rate and see if there are any red flags. Any significant shifts will tell you how effective are the changes you introduce to your store or whether it's time to introduce some new ones. A convenient way to manage the risk of runnning out of stock on trending products. This report monitors the purchase rate and remaining merchandise volumes and makes a prediction about how soon you will be out of stock. Our reporting solution comes with 13 adjustable report types that cover most of your business performance indicators. It may be further expanded with 10 additional reports available both individually and as a pack. allows to display sales data on the chart and to set up a pre-defined reporting period. How is my store doing? Did my promo activities have any effect? shows sales of any item, allows comparisons between items. Now with instant SKU search. Should I keep this item in my store? Does this item need help selling? Which items to put on a 'featured' list? What is the right product to highlight in my promo? How do my sales stack up by orders? What's a good time to send follow-ups? What's a good time to post on social networks? What's a good day for a limited time offer? Is there a recurring shopping pattern I can use? Am I losing more carts than usual? Should I adjust my competitive position? Should I introduce a follow-up solution? shows at what rate the product is selling and how many items are left in stock. Am I at risk of running out of stock? Which items are moving faster/slower? Where is my customer base? Is there a need for extra language option? Do I have to geosegment my communication? Do I have a healthy conversion rate? Am I engaging my customers? Who is my primary buyer? Should I address a specific target group? Does it make sense to offer a 2+1 promo? What's a good threshold for quantity discount? Below are additional reports that could be purchased either as a pack together with an Advanced Reports extension or individually at any time. Note: In case you are using an older version of Advanced Reports it is essential to update to version 2.6 in order for these units to work properly. Where did my sales shift come from exactly? Do I have to start a category specific campaign? Items of which color/size/resolution are trending? What do I remove/add to my product range? Is there a clear brand preference? Which one of my suppliers do I renegotiate with? Would I benefit from more options on any payment type? Do I have to highlight any methods? Do customers make use of coupons? Do I have a healthy retention rate? Do I focus on attracting new customers or selling to the existing ones? Where do I put my next storage/outlet? Do I have to rethink my shipment options? Do my customers go for quality or price? What do I highlight in my communication? Which items I should add to my stock? How effective is my international strategy? How is my customer base distributed? What do I feature during holiday season? What would sell great on discount? Using the Advanced Reports extension together with the below Aheadworks products, online merchants get more valuable insights. Native Magento Enterprise and Aheadworks reward points applied by customers during the checkout are displayed in the ‘Points + Credit’ column of the ‘Orders Detailed’ report and used for total calculations. The same functionality (see above) is available for native Magento Enterprise and Aheadworks store credits. Provides great insight into product sales and providing a general report on product refund rates over a longer period. However if you want refunds for a specific month it becomes more difficult. The "updated at" option is not the same as a true credit memo report. Having that would make this extension perfect for us but as it stands, it's good but not quite great. I've tried a number of other reporting extensions, but none are better than advanced reports. The standard reports are targeted for what you would need plus they can be adjusted to exactly fit your requirements. Their customer service is also very good - ask them a question and they will get back to you quickly and with the info you need. Recommended. It's always a pleasure working with aheadWorks as a great extensions provider. They always keep up with the times and Advanced Reports is an excellent example of a high-quality reporting tool with a bunch of useful features. Get all sales data in a couple clicks. Easy installation and works as advertised, great extension. Gives much more reporting capability than standard Magento reports. This extension is very useful and do whatever is mentioned in the description. Very nice module with good support, well understandable and easy to use! I would recommend to add a report similar to the bestsellers' report, which would list sales of all of products for determined period, together with their, sales quantities, sale total in sales price and sale in total in cost, and also current stock balance. I have over 4000 articles in my store, and I have no tool to understand, where I make profit, where I make less, where I have a problem with liquidity, etc. At the end which products to extend, which to exclude or reduce, where adjust prices? Hope to see such a unit soon, I will be a buyer! Very powerful extension, it's very useful to boost the quality of the reports. Not a bad module, but a bit expensive for what it does. As far as I can tell, none of it looks like it has been coded or designed in India, which is always something to watch out for with Magento, as it's too complex for anyone in this 3rd world nation to do with any sort of quality. This extension helped us a great deal to analyze our sales, and provided the stats crucial for establishing our strategy. Regarding the app's features, some of the included report types are hardly useful, and we would like to have a couple of options that are not present. However, this is a great addition and improvement over the standard Magento reports, so I would definitely recommend this ext for any serious store. Simple a must have in addition to your regular magento extension. Highly recommended to add with sales b coupon code as well. One of my favorite extensions out there. You will not be disaponted in price and quality. Thanks aheadWorks. This extensions has really helped us to analyze our customers purchases and determine what the best marketing strategy is moving forward. Great module, easy to install and set up. Everything you need at your fingertips. Runs quick and you can right click on the graphs and copy the images to put into reports, as well as downloading CSV files. Great extension. We always use that for our sites. Easy to install,easy to use and more important easy for the customers to use it. one thing missing from magento is reporting per product. this is thankfully covered in this module. runs quite fast and has many more reports. nice one. It’s really important for us to analyze our current job using up-to-date reports and see the effectiveness of our business. It’s great that 10 reports are available by default. Now we are thinking about ordering of 2 additional units that will provide us with a couple of extra reports we need. Thank you, guys for the development of such useful plugins. Great extension. Gives more insights than native Magento. We use equally all the included reports. Installation and configuration was simple, without any issues. Thank you. Essential to get the information you need out of Magento CE. Plain and clearly structured reports. 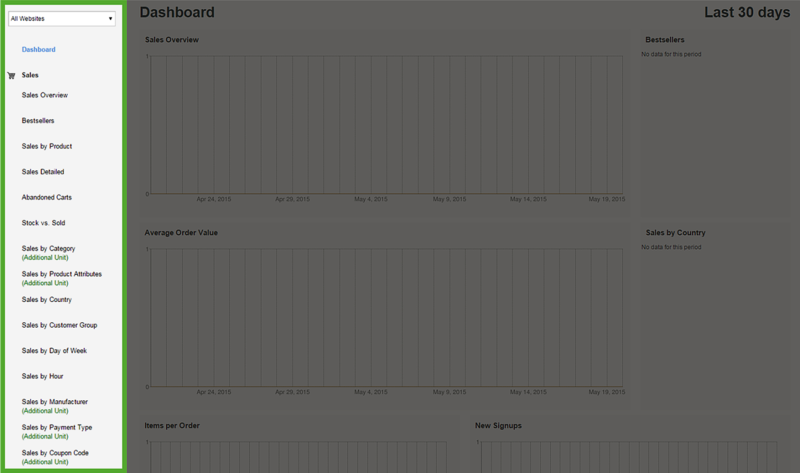 Magento default reports are pathetic and lacking details. Advanced Sales Report by AheadWorks filled this gap! It would be even more awesome if 'Shipping' column could be added to 'Sales Report'. Currently, 'Shipping' column is only found in 'Sales'. Don't wait , just buy it . We must have it!!! I can now receive reports in a number of different ways such as daily, weekly and monthly, and this has really helped me to keep track of my day to day business as well as the times of the week and month that I do the most business. Thanks to these easy to understand reports I can direct my business in certain areas to really help it to develop further. 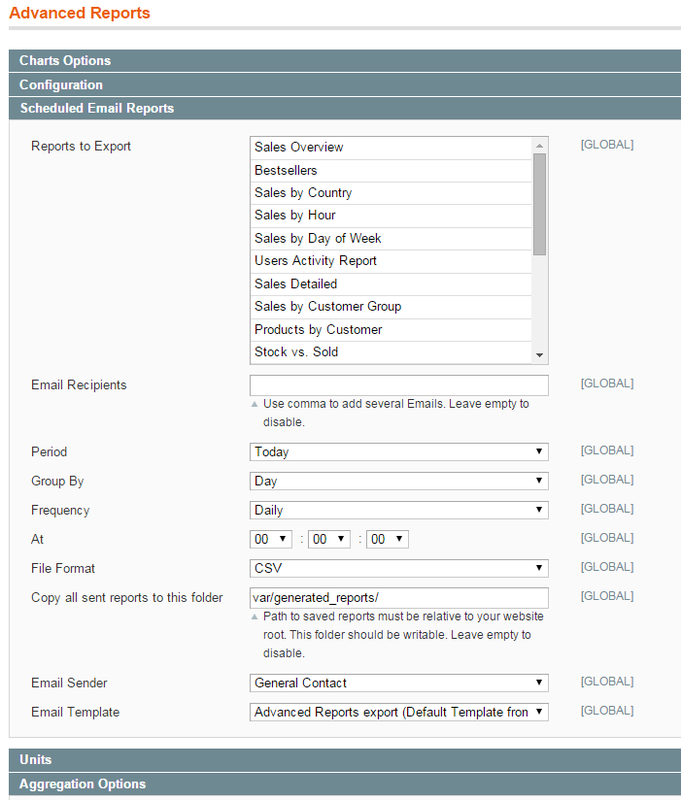 Advanced Reports is the best plugin that provides merchants with different types of stats! It's extremely well thought out, the list of features is extensive! Numerous report types and additional units are great!. The team behind the product is very responsive. We have not used it much yet, but so far it has worked well. We did have an issue after installation and it was resolved by Aheadworks. Fantastic extension. We love it. Installed the extension to get a insight into my sales per country. I needed a little help while installing. The tech department fixed in within a day, great support! Thankfully, the extension does deliver on its advertised features! I especially like the fact that it was quite easy to install by myself with no issues whatsoever. Great work guys! It has advanced settings for sales reports. Pratical module... Also gives great reports with additional reports but it's a little expensive with all additional units. Great Install + Very Useful! We recently purchased this extension in order to broaden our range of information and this was clearly our best option to do so. Installation was very quick and the reports have given us so much valuable information in the very short time of us using this extension, we are all very impressed! Just bought it because of sales by manufacturer..
.. but really blown away from the great features of the "core" module. i dont even use the dashboard anymore, that i normally accessed more than daily. i love the features such as hourly report and day report, country report... now going to probably shop for some more Aheadworks extensions, going to check right now. Love this extension. Easy install. When I first got this extension and got it installed and started comparing advances sales reports to the regular magento sales reports, I was very confused. I even wrote to AW about it. The numbers were so different. I'm convinced now that the numbers generated by this extension are accurate and the numbers coming from the regular sales report are not. My accountant was getting tired of underreported sales! And that is not even mentioning how different statuses can be selected or unselected to show up in these reports, or all of the additional useful reports contained in the package. If you are looking for a way to get end of month sales and taxes in one fell swoop? This does the job, no more using Magento's default order export. The best reporting module for Magento on the market! A must have for any Magento store serious about e-commerce! 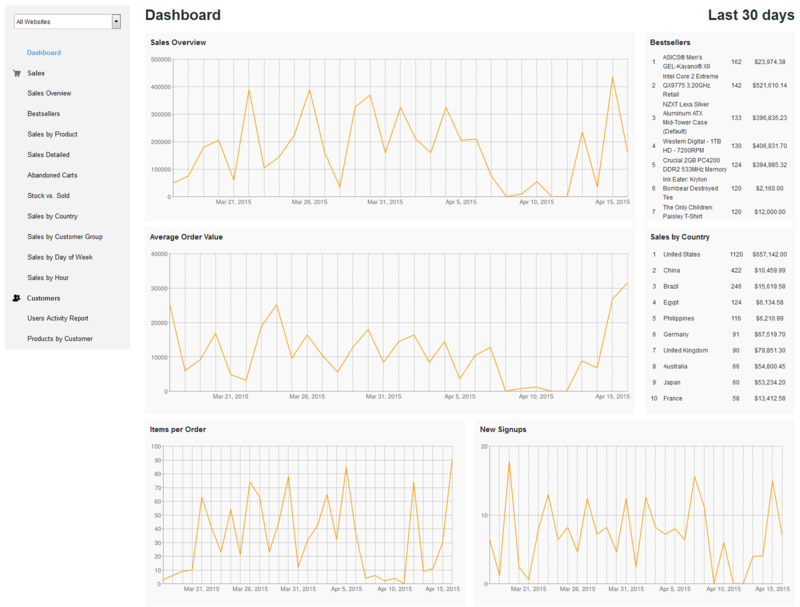 And...don't forget to extend the functionality with addon reports. Wow! Another winner from AheadWorks! this is an great extension to use. You can get useful information! What a great module! It slices and dices my statistics and gives me great insights into my website. We needed more functionality from the reports section of Magento and the advanced reports added some much needed tools to Magento. This extension is a must-have for any storeowner! This module makes it very easy for me to understand what's happening on my site. I definitely recommend this to anyone who needs to forecast product cycles. This is a great extension. The reports are very insightful and should have been part of Magento's core reports. The price is reasonable considering all the information you get at one glance. No one running a webstore should be without this extension. The only issue is that this does not work well with the OneStepCheckout extension. Some reports may not work properly if OSC is installed on your site. Very useful extension, great tool to visualize all sales data. Worth the price. select by category. This is important with you have more than 2000+ products. It works exactly like it says it will and the installation is just as easy as they say. Their installation instructions are clear and concise. I got it up and running in no time at all! Thank you for yet *another* phenomenal product! What a great module! It slices and dices my statistics and gives me great insights into my website. However I have 8000 sku'd products and woudl like to segment the data by category and also by profit margin. Thsi would make this module incredible. The best analytics extension you can buy. Advanced Reports is another one of aheadworks' Must have extensions. If you run a Magento store and do not have an advanced analytics extension like this one you are wasting time and losing money. It would take a ridiculous amount of time to manually figure out even one of the almost 20 reports available at a glance with this extension. The reports will help you market your products more effectively, the insights they give you are incredibly valuable in helping you optimize your avg. order volumes, conversion rates, customer retention, new customer sign ups, product reviews, and more. All in all it is a great extension for a good price and I recommend it to anyone who uses Magento for their business. I can not wait to see what aheadworks adds to this extension in the future but I'm sure they will think of something ingenuous. Magento is lacking the reports department so this extension provides some very useful additional information. Installation was straight forward and I had no problems other than needing to clear the cache. The functions provided by this extension are a great help when you want to get more insight into your webshop. Besides that they are lot more informative than the reports provided by magento.